The Mercedes CLA 45 AMG Shooting Brake was unveiled together with the rest of the pseudo-wagon range last November, but photos of the AMG model were lacking back then. The 360 hp load-lugger has just gone on sale in Europe, so we now have more pictures of AMG’s latest. Despite its sloping roof, the Shooting Brake is significantly more practical than the standard CLA-Class. The boot has a maximum capacity of 1,354 litres with the rear seats down, and rear headroom has marginally increased over its four-door coupe sibling too. What hasn’t changes so much is the performance. You still get the same M133 2.0 litre turbocharged engine that makes 360 hp and 450 Nm of torque like on the A 45, GLA 45 and CLA 45 AMG models. 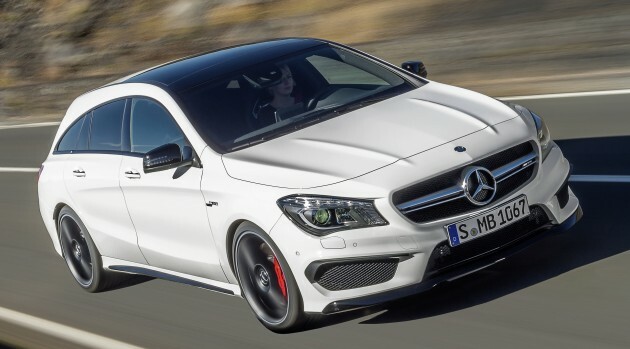 Zero to 100 km/h takes 4.7 seconds, just 0.1 seconds off the regular CLA 45 AMG. Top speed is the same 250 km/h. The rest of AMG’s 45 series are officially on sale here in Malaysia. The Mercedes-Benz A 45 AMG goes for RM346,888, the GLA 45 AMG for RM378,888 and the CLA 45 AMG Coupe RM392,888. How much do you think the CLA 45 AMG Shooting Brake will be priced if or when it comes here? I think this is one of the ugliest MB design in the inventory. Sorry to say that. The head lamp is copy from Proton Saga! Pity Mercedes! and the 3 pointed star emblem copied from E class!! Does it matter how much they priced it here? Bring more to Malaysia please, A 45 is fully booked. Ali: copy from Proton saga. Sooo??? can you i can’t afford it? should be between A 45 and GLA 45, else people should just go for GLA 45.